October is Adopt a Shelter Dog Month! What better time to surprise a special friend with a rescue angel bracelet from For Love of a Dog. Each and every one is handmade and celebrates the angels who rescue dogs. The bracelet shown above includes a true blue handmade porcelain RESCUE dog bone, lovely artisan lampwork beads, sparkling crystal rondelles. A silver angle wings with halo charm dangles from the bone and the clasp is a silver dog collar and dog bone toggle. Fetch this bracelet if you enjoy copper. This warm tan porcelain RESCUE dog bone is surrounded by chubby turquoise and earthy picture jasper gemstone beads. Lovely angel script with dangling wing copper charm. This bracelet is a sweet combination in spring green and rose pink. Beautiful artisan lampwork beads with a green swirl base and little roses coordinate with rose pink chunky crystal rondelles. Another of these charming silver angel halo and wings charm, plus dog collar and dog bone toggle clasp. The bracelet shown above includes a scarlet red porcelain RESCUE dog bone focal with coordinating red crystals and creamy white riverstone gemstone beads. A silver angel halo with wings charm, plus dog collar and dog bone toggle clasp. Fetch more handmade dog rescue jewelry from For Love of a Dog. 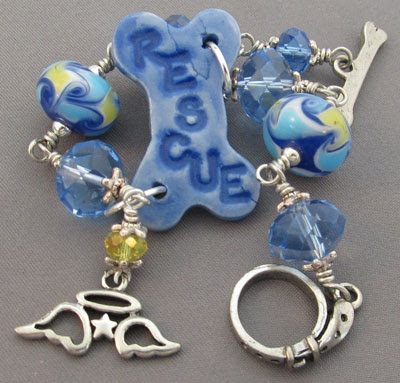 Not only do we create jewelry, we support rescue. They are all gorgeous Sue, you are making it hard for me to choose one!